In the past two or so years since I discovered Carrie Aarons’s writing, she’s become a go-to author for me, thanks in large part to her ability to insert wit and humor in majority of her books. There are the rarified few which don’t fall in the romantic comedy sub-genre, bringing with them a darker feel. In the case of the author’s latest standalone, it’s not as much dark as it is angtsy. Being the angst addict that I am, you won’t be hearing any complaints from me. This second-chance love story about a married couple on the brink of divorce and may have a heavier theme and overall feel to it compared to Aarons's other novels, but it still has that Aarons touch and her on-point writing. From the moment they met, it was clear just how different Theodore Patrick Walsh and Imogen Virginia Weston were. He was the orphaned, blue-collar townie from Nantucket and she was the pampered daughter of one of the richest families in the country from Chatham. Despite being from opposite sides of the social and financial spectrum and against her family's objections, Theo and Imogen marry...but happily-ever-after isn't in the cards for them. 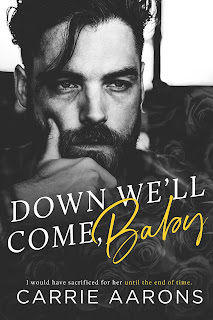 When their struggles with infertility and her own stagnant professional life become too much to bear, Imogen walks away from Theo and the life they've created. She's back in the family fold, but she needs a favor from her estranged husband. He agrees for as long as it means an absolute end to them...then a miracle happens. Purchase Down We'll Come, Baby on Amazon.